Your home can have a look that stands the test of time with building stone fronts. We have a huge variety of stone. You will find a look you love for your home, fireplace or landscaping. And when you buy where the contractors buy, you know you’re getting a good deal. Our client service representatives are ready to help you decide on the look you want. Selling high-quality building material at low prices has been our family’s mission since 1938. We take pride in having the best client service in the region. Our representatives will listen to your needs and give you helpful suggestions on which style, shape and color of building stone you need. Our quality service sets us apart. You won’t find other stone sellers in the region who understand your goals like we do. We have been helping homeowners make informed decisions for 80 years. Our commitment to our clients has kept them coming back for building stone again and again. We sell the bulk of our building stone to contractors. That’s because they know their clients will love the quality. And they’re looking for the best price around. You can get the same value as the pros for your building stone. We promise top quality building stone at contractor prices. You add grandeur to your house when you install building stone home fronts. That stone look is one of timeless beauty. It tells the world that your home is built to stand up to whatever Mother Nature can throw at it. The stone look is universally pleasing. Our Chocolate Gray and Lake George building stone are our big sellers because they offer the same look and feel as the stone quarried in this area, a hundred years ago. We offer a wide range of building stone to match any look, from contemporary to rustic log cabin and everything in between. We carry more than 15 types of stone veneer. Our sales representatives can help you find the right stone to match your style. If you’re after a rustic mountain look, a fieldstone may be your best bet. The classic D.C metropolitan look is typically a blue, gray and brown quarried stone that may be either a mosaic format or a more formal square/rec format. Lately, we’ve seen quite a few selections of a more tan/light brown stone, to get away from the darker material. The options are endless, let us help you figure it out. As can be expected, building stone typically requires less maintenance that other forms of house exteriors. Vinyl siding, wood and even Hardy Plank need care and/or paint, every few years. Stone is the exception to that rule. With building stone, maintenance is not an issue. Building stone looks great after five years, 10 years, 20 years and 30 years. You spend fewer weekends on routine repairs and maintenance. 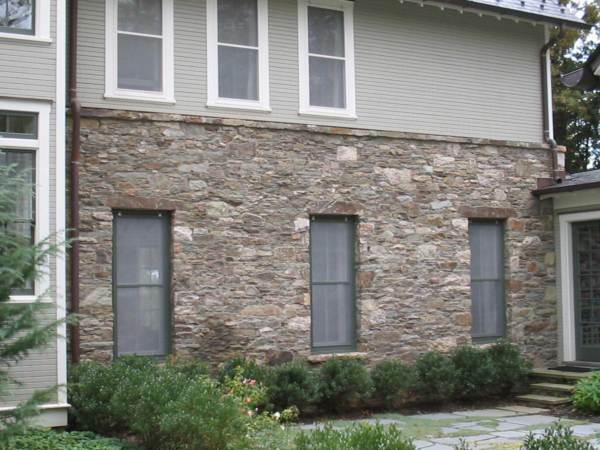 Over time, building stone can save you money. When you buy stone, you invest in a product that will last decades, if not a lifetime. Your initial expense of stone and installation should be your last. Most people don’t factor in the maintenance and repair cost, over time, of other exterior material. In addition, stone veneer provides an added weather barrier to the harshest of conditions. At Irwin Stone, sustainable building is in our DNA. We even partnered with GreenCasaMaryland to help build a certified net-zero energy home. Our stone is a natural product sourced right from the quarries. While it takes some energy to cut stone into shapes that are useable as veneer stone, it’s not as much energy as other exterior products. The extra insulation value of stone means less energy wasted heating your home. That’s part of the reason why stone veneer help homeowners achieve Leadership in Energy and Environmental Design (LEED) certifications. In addition, stone veneer doesn’t need chemical treatments to stay looking great. No staining, no painting, no weatherizing, no harsh substances. Fewer synthetic coatings mean fewer pollutants in your environment. Walls are critical landscaping components. They can define your gardens, keep people out of places you don’t want them, direct traffic where you want it to go and halt soil erosion. Aside from the utilitarian, building stone gives your landscape’s walls a feeling of substance and opulence. A stone wall can be the “finishing touch” for your landscape needs. As with home fronts, our wide variety of building stone are suitable for walls. With a multitude of colors, types and shapes, you will find the stone you need for the look you want. Our highly trained salesmen will listen to your needs and make informed recommendations to get your landscaping looking spectacular. Stone is a versatile look. The most famous barriers in history like the Great Wall of China and Hadrian’s Wall are stone and have stood for centuries. Most landscaping walls are cinder block interior with building stone as the veneer or exterior skin. They can be single sided or double sided, depending on their use. From time to time, we see free standing stone walls, as they were built in the old days. Stone can also be inviting. A short wall around a garden invokes feelings of a country farm or an 18th century hamlet. Small, regular shaped stones give that homey vibe. Your yard can be an idyllic slice of the country, a simple escape from the pressures of modern living. Best of all, you get these looks throughout the year. Your flowers and trees may wither away in the winter, but your wall will always look great. If your yard has a slope, you know the importance of retaining walls. Soil erosion can wreck a landscape. It creates large drops and, even worse, can cause drainage issues. Any homeowner who has dealt with drainage problems knows the dangers they pose. Standing water can drown plants, attract disease-carrying mosquitoes and even damage your foundation. These are the kind of problems you’d rather prevent than repair. A retaining wall prevents these issues by keeping your lawn grade steady. Rather than dramatic dips that can wreak havoc on your drainage, you get regular grading up to the wall, the controlled drop of the wall, and then regular grading along the rest of your yard. The retaining wall gives you consistency. You can control exactly how your yard slopes, preventing pooling and ensuring proper drainage. Retaining walls direct water where you want it to go. Placing pipes in the wall can allow groundwater to seep through, preventing hydrostatic pressure buildup that can give you wet basement walls. A retaining wall also provides more level, useable space. The spot above a retaining wall is great for a garden, seating area, firepit or freestanding fireplace. The wall can push plants that need more light above the rest of the landscape. And you can use plants that prefer shade on the lower side of the wall. Your landscape is an expanse full of potential. With every feature you want to add, you need to delineate your space further. Your landscape won’t make sense if your vegetable garden flows into a fireplace into a pool. Stone walls make your landscaping into “rooms.” Your features will have obvious starting and ending points. The walls also help draw attention to focal points and keep guests where you want them. And building stone walls look great for decades with little to no maintenance. Your gardening tastes may change, but you’ll always have a stable foundation when you work with building stone. Stone veneer can also save you tons of time and money on deluxe patio features. Building stone can be laid on concrete bases for outdoor kitchens, firepits and freestanding fireplaces. You get the beautiful look of all-stone features for a fraction of what it would cost to build them. The materials are much cheaper, and the installation requires a lot less labor. If you’ve been dreaming of adding to your patio, talk to our client service representatives. They’ll know just what you need.